CHESS—short for the Colorado High-resolution Echelle Stellar Spectrograph—is a sounding rocket payload that will fly on a Black Brant IX suborbital sounding rocket early in the morning of June 27, 2017. CHESS measures light filtering through the interstellar medium to study the atoms and molecules within, which provides crucial information for understanding the lifecycle of stars. "The interstellar medium pervades the galaxy," said Kevin France, the CHESS principle investigator at the University of Colorado, Boulder. "When massive stars explode as supernovae, they expel this raw material. It's the insides of dead stars, turning into the next generation of stars and planets." Scientists know which wavelengths are blocked by what, so by looking at how much light reaches the space around Earth, they can assess all sorts of details about the space it travelled through to get there. CHESS data provides observations such as which atoms and molecules are present in space, their temperatures and how fast they're moving. The scientists also use CHESS data to evaluate how the interstellar cloud is structured, which can help them pinpoint where it stands in the process of star formation. It's still not known exactly how long it takes for this material to be incorporated into new stars. But scientists know dense clouds can pave the way for the collapse at the very beginning of star formation. The flight of a sounding rocket is a short one; CHESS will fly for about 16 minutes total. Just six-and-a-half of those minutes are spent making observations between 90 and 200 miles above the surface—observations that can only be made in space, above the atmosphere, which the far-ultraviolet light that CHESS observes can't penetrate. After the flight, the payload parachutes to the ground, where it can be recovered for future flights. This is the third flight for the CHESS payload in the past three years, and the mission's most detailed survey yet. The scientists have used each to trial and improve the technology; the upcoming flight sports an upgraded diffraction grating, which reflects light and separates it into its different wavelengths. "A more efficient grating means the instrument is that many times more sensitive," France said. "Compared to the first flight of CHESS, this third incarnation is about eight times more sensitive." By flying rapidly developing instruments on relatively inexpensive sounding rockets, scientists are not only able to acquire high-quality science data, but also test and mature their instruments toward possible spaceflight. According to France, the CHESS instrument serves as a spectrograph prototype for NASA's LUVOIR concept. "Supporting technology and suborbital flight projects today directly translates into lower risk and shorter development time for NASA's large missions in the next two decades," France said. The launch window for CHESS opens at 1:10 a.m. EDT at the White Sands Missile Range near Las Cruces, New Mexico. Precise timing of the launch will depend on weather conditions. CHESS is supported through NASA's Sounding Rocket Program conducted at the agency's Wallops Flight Facility, which is managed by NASA's Goddard Space Flight Center in Greenbelt, Maryland. Orbital ATK provides mission planning, engineering services and field operations for the NASA Sounding Rocket Operations Contract. 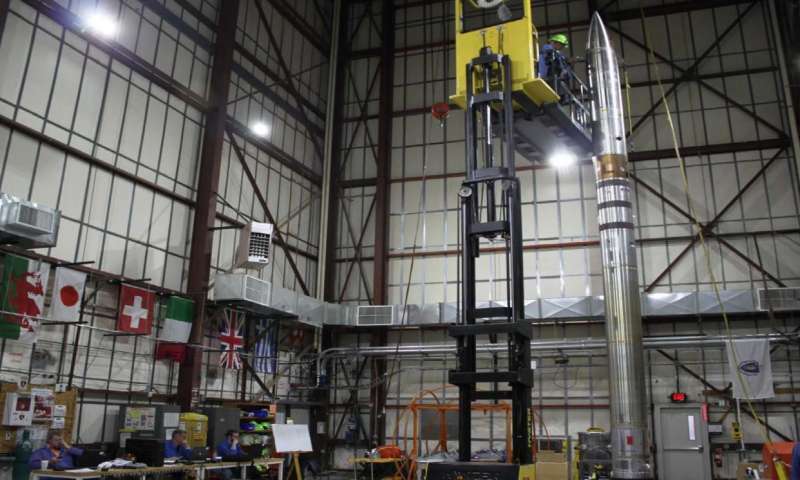 NASA's Heliophysics Division manages the sounding rocket program for the agency.